Black's knight can't recapture the queen, and so he or she resigns. Of course, that still doesn't excuse hanging the bishop with 5. Bc4. Disclosure: I didn't invent the pun that heads this post. I saw it in a tactics book somewhere; I just can't recall which one. Lamarr Wilson, a longtime fixture on the scholastic chess scene in Chicago as a coach, blogger, webmaster, and, just as important, photographer, has posted hundreds of his pictures from years past on flickr. Lamarr's collection includes shots of Chicagoland's top young chess players; a few grownups, such as GM Dmitry Gurevich and IM Angelo Young; and, I'm delighted to see, the tournament we held at Ray School in cooperation with the Youth Chess Foundation of Chicago in March 2007. 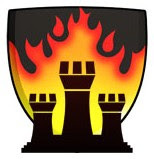 If you're a chess blogger, coach, player, or parent, you'll want to check it out. Thanks for sharing these, Lamarr. It's been awhile since I posted a Wacky Wednesday game, but this one begs to be published, since it exemplifies the genre so perfectly. How the chess candidate plays in the heartland. I’ve been reading lately about a chess tactic called “windmill,” a kind of discovered check that keeps repeating as the piece that moves picks off the opponent’s pieces while the opponent’s king is in check, then returns to the original position to start the process all over again. It can be devastating for the player on the receiving end. Yasser Seirawan says it’s a rare tactic, and apparently so, because the two chess books in which I read about it, Yaz’s Winning Chess Tactics and Eric Schiller’s The Big Book of Chess, both use the same game to illustrate it: Carlos Torre vs. Emanuel Lasker, Moscow, 1925. Here’s the key position. Material is even. Black has just played 24. 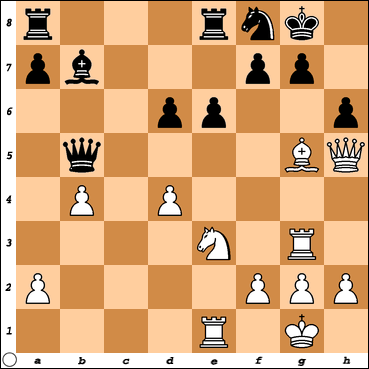 … Qb5 to avoid the attack by the while knight on e3. White plays 25. Bf6, offering Black a queen sacrifice, which he has little choice but to accept, since his queen is en prise. Queen takes queen, and then it’s 26. Rxg7+, to start the attack. Watch the entire game below and see for yourself. When the combination is over Black is up three pawns. Lasker may have been a former world champion, but he probably didn’t feel like much of a champion that day. The fortunes of America's top chess players in this year's championship tournament are chronicled in the current issue of Chess Life magazine, and top billing goes to Barrington, Ill.-based GM Yury Shuman, who led the pack and brought the championship home to the Prairie State. Yury, a member of the Chicago Blaze, had finished a close second at the championship meet two years ago. This year he arrived at the event in Tulsa knowing he had a good chance to win. He also knew he'd have to outplay reigning champion Alex Shabalov as well as former champs GMs Boris Gulko and Alexander Onischuk and other hungry competitors, like GM Sergey Kudrin, GM Varuzhan Akobian, IM Josh Friedel (who earned his final grandmaster norm in Tulsa), and Blaze teammate GM Dmitry Gurevich. Here are two of Yury's most exciting games from the eight-round event. Check out the tripled-pawn situation he overcame in the endgame against IM David Preuss. And see why Chess Life Online used the word "carnage" to characterize Yury's seventh-round confrontation with GM Julio Becerra-Rivero. I can’t resist the bonhomie of street chess, so when I found myself in Toronto for the day last Thursday, I made sure to visit the one spot in town where I knew there to be a lively version of it generally in progress: the courtyard of the Metropolitan United Church, on Queen Street between Church and Bond. The churchyard has four chess tables located a piously appropriate distance from and building’s entrance. Still, if you enter the church from the front you can’t avoid walking past the chess boards. From about 3:30 in the afternoon on there were five or six games going on at any time, the woodpushers having appropriated not just the chess tables proper but some of the assorted picnic tables that also dot the yard. The scene was mostly male and slightly raucous though perfectly friendly. Five-minute blitz appeared to be the game of choice, though some clock-free games were under way. No money changed hands at the table where I played (won 1, lost 2). 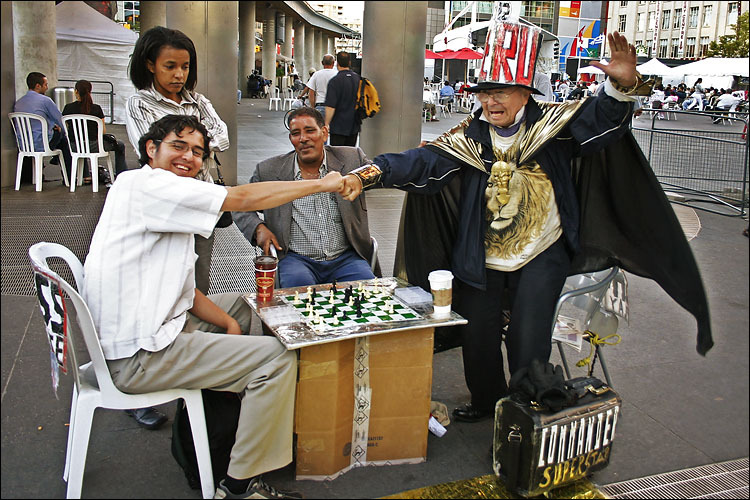 I also stopped by the incredible plaza at Yonge and Dundas to see the irrepressible chess entertainer Raul, who holds court on the corner. He charges five dollars a game (“a donation, not gambling”). I didn’t have time for that. Maybe next visit.